During the past few weeks, one of the first native flowering trees to appear along the parade route that stretches from Thomasville to Rising Fawn has been the eastern redbud. When the time for the redbud to bloom arrives, it doesn't pass by our personal viewing stands with the bravado of a marching band. Instead, I liken it to the passage of a beautiful, flower-draped Rose Parade float. The redbud tree is familiar to most Georgians as it occurs throughout the Peach State. However, the tree is less common in the Coastal Plain, particularly in southeast Georgia. The redbud is one of our smaller native trees. Indeed, a 40-foot redbud is a giant. Most mature redbuds are actually much smaller. If you would like to take a gander at the tree the Georgia Forestry Commission has certified as the state champion redbud, you will have to travel to Forsyth, just north of Macon. The tree holding the title sinks its roots in the soil just beyond the parking lot behind United Bank in downtown Forsyth. This redbud was discovered by John Jensen, a senior wildlife biologist with Georgia DNR’s Nongame Wildlife Conservation Section. The redbud has attractive foliage. Its 3- to 5-inch leaves are heart-shaped. In autumn, these leaves turn yellow-green. The tree produces long, flat, green seedpods that remind me of Kentucky wonder pole bean pods. The pods turn brown to purple in fall. While the color provided by the tree's foliage and seed pods is pleasing to the eye, they do not compare to the floral show created by the tree’s flowers in early spring. These 1/2-inch blossoms are shaped much like English pea blooms. Their color can best be described as rosy-pink or reddish purple. The blossoms are arranged in clusters on year-old twigs and even the tree's trunk. It is no coincidence that redbud flowers look much like those of a pea. Like the pea, the redbud is a member of the Leguminosae family, a large group that includes some 13,000 other plants. However, unlike many of those members, the redbud is not blessed with nitrogen fixing root nodules. Eastern redbuds bloom before the leaves appear on most trees. As such, they bring a splash of spring color to our often otherwise bleak late winter/early spring landscape. If you are like me, you have probably often wondered where the redbud got its name. Supposedly, the tree is named for the color of its unopened buds. While I will admit these buds are often dark pink, I think it is a stretch to say that they are red. Odder still is the fact that the redbud is sometimes called the Judas tree, which is a common name for many redbud species, including one found in the Mediterranean and Asia Minor. According to legend, after Judas Iscariot betrayed Jesus, he hung himself on a redbud tree. Supposedly before that, the tree's blossoms were white. Ever since Judas’ death, they have been colored red with blood and shame. The redbud provides food for a variety of wild animals; however, it is not nearly as important a food plant as oaks, dogwoods and some other native trees. Its seeds are eaten by birds including cardinals, rose-breasted grosbeaks, quail and wild turkeys. Deer and squirrels will also dine on the seeds. Deer will also browse on young redbuds. 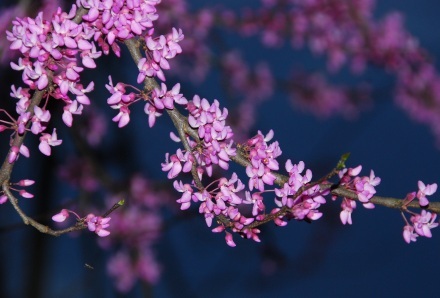 That being said, in late winter and early spring, redbud blossoms are an important source of pollen and nectar for a number of animals such as bees, moths, butterflies and ruby-throated hummingbirds. While the only butterfly known to use the redbud as a host plant is Henry's elfin, a 7/8- to 1 1/8-inch grayish-brown butterfly, the redbud is the host of a small number of moths, including the strikingly beautiful lo moth. In the wild, redbuds are considered an understory tree, prospering in the partial shade found beneath the canopy of much larger trees. However, it will also grow in open sites. While the tree does well in rich, moist soil types, they can also be found growing in dry sites. Redbuds will even grow in the infamous Georgia red clay soils that make gardening difficult for many of us. The redbud is not a valuable timber tree, but folks have long used the plant in a number of other ways. For example, a concoction made from the bark of the tree has been used to treat dysentery. In addition, some adventurous folks are said to add redbud blossoms to their spring table fare. They sometimes sprinkle them on salads. I am sure that when served as a garnish, pickled flower buds quickly become a topic of conversation. In addition, young seedpods are sometimes eaten as a cooked vegetable. The ability of this tree to grow in a variety of soil types, along with its small size and the fact it is relatively pest-free, make the redbud a great tree to plant in most yards. Consequently, it is not surprising that it can be seen growing in cities such as Atlanta, as well as suburban and rural yards. When planted in an open setting, the tree will sometimes spread out up to 30 feet. The trunk's habit of dividing close to the ground helps create a super-small shade tree. If planted in partial shade, it will reward homeowners with delightful spring color at a time of year when, aside from daffodils and forsythias, most yards are devoid of flowers. Redbud trees are easy to grow. They can be bought at many nurseries. In addition, since the tree readily reseeds, if you look around the base of a redbud, you are likely to find an abundance of seedlings ready for transplanting. As such, it is an ideal pass-along plant. Should you decide to set out a redbud tree, as is always the case when setting out a tree or shrub, take the time to do it right. Begin by digging a hole at least three times the diameter of the transplant's root system. When the tree is placed in the hole, make sure it is not planted any deeper than the soil line on the trunk. Before refilling the hole, break up any clumps of soil. Then heavily water the dirt. Finally, keep watering the sapling until the plant begins to grow. Since the tree blooms when it is only 4 or 5 years old, you won't have to wait very long to enjoy its color. For the next couple of weeks we can sit back and enjoy the redbud's beauty. However, as is the case with all spring flowers, its time marching past our own personal viewing stands will soon be over as Mother Nature's spring parade moves on toward summer. Then it is time to get ready for the next batch of flowers to appear along our local parade route. One of the most notable of these is the flowering dogwood. Isn't spring great? Terry W. Johnson is a former Nongame program manager with the Wildlife Resources Division, a backyard wildlife expert, and executive director of TERN, the friends group of the Nongame Conservation Section. (Permission is required to reprint this column. Contact rick.lavender@dnr.ga.gov.) Learn more about TERN, The Environmental Resources Network, at http://tern.homestead.com. “Out My Backdoor” archive.